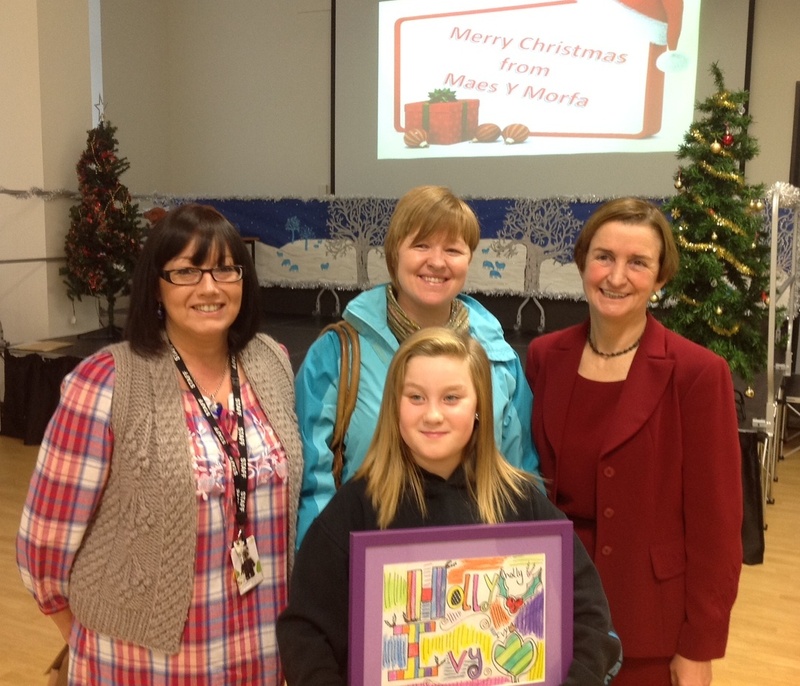 The winners of Nia Griffith MP’s Christmas Card competition were Shannon Goddard, age 9, of Maes y Morfa School, who won the Junior category, and Ali Sohail of Ysgol y Felin, who won the Infant category. As well as seeing their designs feature on the MP’s Christmas cards, they have received framed copies of the designs they drew and a prize of £100 for their schools. Pupils were asked to produce a design suitable for a Christmas Card on the theme of the holly and the ivy. Mandi Dunlop Ferraro, photographer, Roz Moreton proprietor of the Saith Gallery, Burry Port and Laura Burnip of the Llanelli Star kindly undertook the unenviable challenge of judging the competition. In addition to the winners, they selected runners up, whose pictures will feature in miniature on the back of the cards. These were, in the infant category, Dominic Crosswell of Ysgol Parc y Tywyn, Charlotte Town of Ysgol y Castell and Luke Thomas and Lorena Aboulachouaq of Ysgol y Felin, and, in the junior category, Angharad Rutherford of Ysgol Gynradd Cross Hands, Ryan Nicol and Chelsea Hayward of Dafen, Ryan Thomas of Ysgol y Felin and Matthew Williams of Ysgol y Castell. Courtesy of the market manager, there will be a display of the entries in the former Pound Shop in the Cowell St entrance to Llanelli Market throughout the Christmas period. The display will include all of the winning designs plus the pictures that the judges placed in the very highly commended, highly commended or commended category.